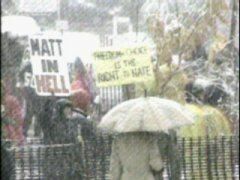 I prefer to go to Matthew's Hell!" Robert Sevigny, Matthew Shepard and many other's murder, as well the suicides, did not occur in a vacuum. This crime happened at time when the lesbian and gay community is under siege by religious political activists. The recent anti-gay political rhetoric by right wing organizations and members of Congress have created a climate where hate crimes are more likely to occur. Crimes such as these arise out of minds twisted and misinformed about lesbian and gay people. The leaders of the most powerful religious political organizations -- some of which have headquarters right in Colorado -- have made a strategic, political decision to target gays and lesbians. The leaders of these religious political organizations -- including Focus on the Family and its political offshoot, the Family Research Council; the Christian Coalition; Coral Ridge Ministries and a host of others -- have made a strategic political and economic decision to target gay men and lesbians. Their national advertising campaign strongly implies that gay people are defective. Such ads -- now appearing on television across the country -- repeat myths and misinformation about gay people, ignite and then fuel a climate of intolerance that too frequently leads to violence. The ultimate victims are people like Matthew Shepard and Robert Sevigny -- people who happen to step into the paths of individuals who are swayed by the messages of such ads and by the climate of intolerance that they foster and encourage. Because these organizations wear the cloak of Christianity,' some of the people who hear their messages mistakenly think they are being given some kind of religious permission to hate lesbian, gay, bisexual and transgendered people. The Family Research Council, a conservative Christian group in Washington that has lobbied Congress to reject gay-rights legislation, also condemned the attack. I just ask myself if this is just a hypocritical move or not... But you they cannot preach hate and then condemn this hate results! Meanwhile, the Rev. Fred Phelps, the leader of a Topeka, Kan., church whose members regularly engage in anti-homosexual picketing, said he was planning a demonstration at Shepard's funeral. They have no respect even for the dead, for his family and friend pain! They call themselves Christian, but if they lived in Jesus Christ's years, they would have been the first to kill him! "I was deeply grieved by the act of violence perpetuated against Matthew Shepard," said President Clinton in his statement.. "There is nothing more important to the future of this country than our standing together against intolerance, prejudice, and violent bigotry. It is not too late for Congress to take action before they adjourn and pass the Hate Crimes Prevention Act. By doing so, they will help make all Americans more safe and secure." A study released in August by Dr. Karen Franklin, a forensic psychologist at the Washington Institute for Mental Illness Research and Training, suggests that harassment and hate crimes against gay students by their peers is commonplace. According to the study, nearly one-quarter of community college students who took part in this survey admitted to harassing people they thought were gay. Among men, 18 percent said they had physically assaulted or threatened someone they thought was gay or lesbian. And 32 percent admitted they were guilty of verbal harassment. A study suggests that harassment and hate crimes against gay students by their peers is commonplace.